Welcome back. 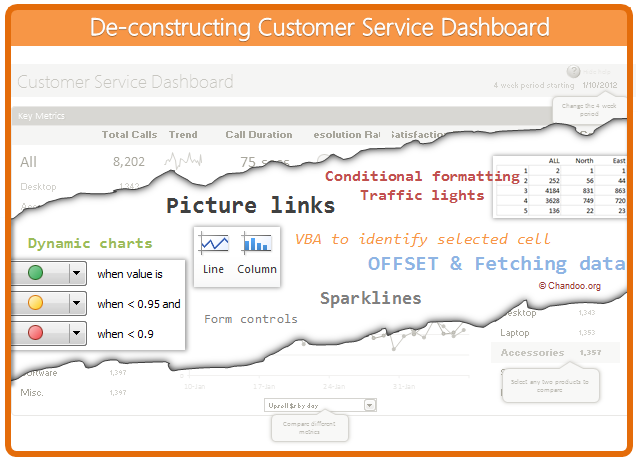 In part 3 of Making a Customer Service Dashboard using Excel let us learn how to create the charts in our dashboard. I like to keep a header area on all my dashboards. The purpose of header is simple. It shows key summaries and gives the users a sense of what is going on. In our customer service dashboard, the header has various key metrics & their trends, as shown below. The trend of calls for “All” and 2 selected options is shown as sparklines. Sparklines, a new feature introduced in Excel 2010 is very handy and easy to use. All you had to is select the 28 day call volume figures for ALL & 2 selected options and then go to Insert > Sparkline. Select the line sparkline & bingo, the sparklines are added to your workbook. Just cut them and paste them on the dashboard sheet. This is done with Conditional formatting. Another favorite feature. First we need to decide the traffic light conditions. In our case, I have defined below rules. Distribution of customer satisfaction ratings is shown as a column chart. This is in fact a sparkline. The data for this is in Calcs!L42:N46. This is calculated using beloved SUMPRODUCT as shown in 2nd installment. To insert the chart, just select L42:N46 in Calcs sheet and click on Insert > Sparklines (Column) chart. Move the chart to Dashboard sheet. To explain the dynamism of this chart, I have made a brief video. Please watch it first. So how this chart is made? From the calculations we have learned in 2nd part, you know that we constructed 28 day information for all 5 charts. 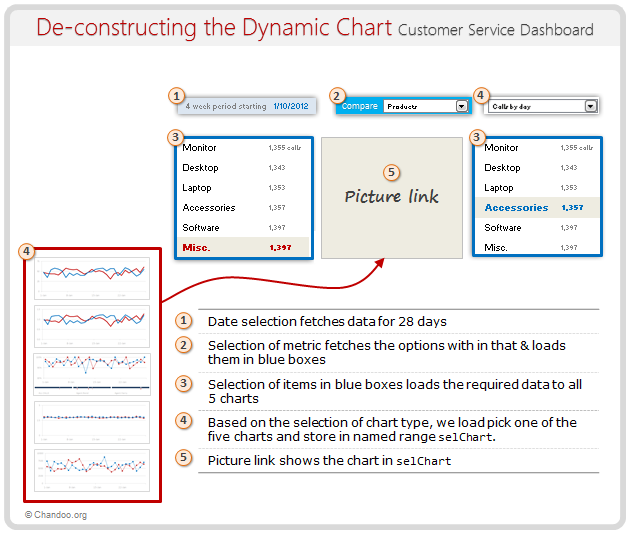 Select each of these 5 types of info & create charts. We will end up with 5 charts. Place them neatly in empty cells. Next, define a named range selChart, that returns one of these 5 cell ranges based on which chart user wants. I am sure you can figure out the rest of the details. See this illustration to understand how this chart is made. Examine the charts to learn better. Change the drop-downs, date values in dashboard sheet to see how the formulas work. So far, we have learned about the design of this dashboard, calculations behind it & how the charts are put together. In the final installment, learn about the remaining pieces of the puzzle – VBA code, design tricks & future direction of the dashboard. What charts you would put in this dashboard? I liked the challenge of creating one dynamic chart that can show any data & analysis based on user’s wants. But I am sure there are more interesting ways to display call center data. So go ahead and tell me what charts you would include in a customer service dashboard. Bonus points if you can make the dashboard and share it with us. Go ahead and share your thoughts using comments. this is truly one of the most complex dashboards I've ever seen, with the final product served nice and tidy! GRATS. I've gone through your CS dashboard. It is awesome. But I'm stuck with linking one chart out of five part. Could u pls suggest any reading on this part in details?